1a. Stems ~2 cm thick, branched at base. 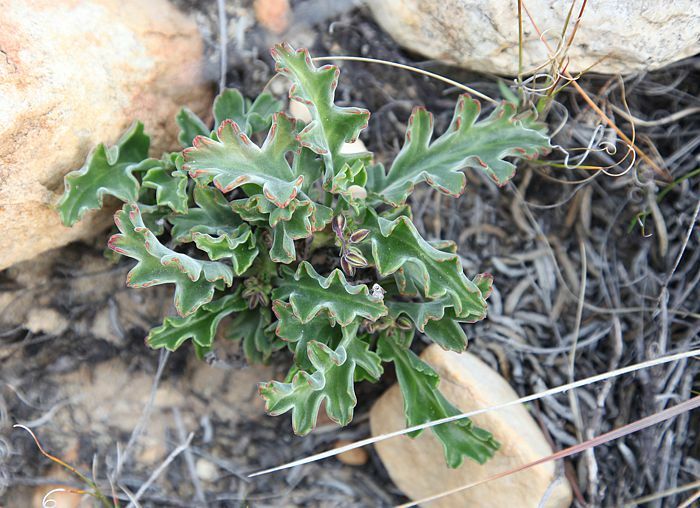 Leaves more or less herbaceous with a white involute margin, lamina bipinnate and toothed. Pedicels long. Petals white to pink. Gen. Syst. 1 (1831) 730. 1b. Stems ~7-8 mm thick, conspicuously branched. Thick tubers develop between root and stem. Leaves more or less succulent with a purple margin, lamina bipinnate with narrow leaflets. Pedicels short. Petals white. 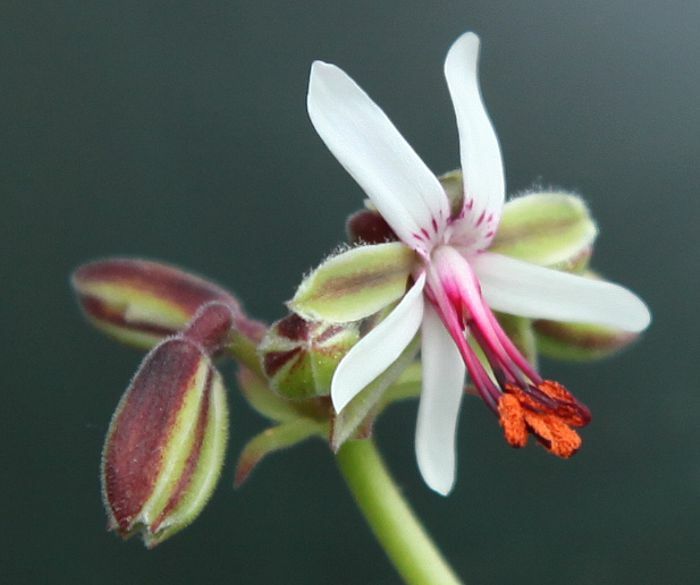 Erect, branched stem succulent, up to 30 cm high (60 cm when in flower), stems smooth, at first microscopically covered with short hairs, later glabrous, with yellowish grey peeling bark. Simple, abaxially with microscopically short hairs, interspersed with glandular hairs, pale green, lamina ovate, deeply pinnatifid almost to rachis, with segments decurrent, apices of segments dissected, margins entire, lamina 75-120 x 35-65 mm, petiole 25-80 mm, stipules deltoid, 1.5-2 x 1.5-2 mm, brown (even when young). Inflorescence branched into a series of 2-10 pseudumbels each of 5-18 flowers. Pedicel 7-25 mm. 5, narrowly ovate, 5-8.5 x 1.5-2.5 mm. Hypanthium 3-8 mm. White to slightly pinkish, posterior two oblong with a basal constriction, slightly auriculate, apices rounded, 7-15 x 3-4 mm, sharply reflexed, with a series of parallel linear markings, anterior three spathulate, with a short claw, 7-12 x 2.5-4 mm, recurved. 5 fertile, 2 longer, 2 intermediate, 1 shorter. 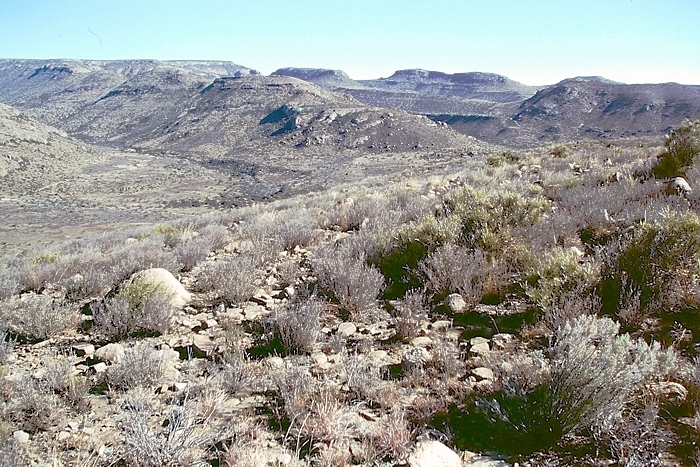 The hilly landscape around Cradock, E Cape, a summer-rainfall area photographed in the middle of winter in August 2002. Many pelargoniums grow here: P. aridum, P. alchemilloides, P. worcesterae amongst bushes and succulents. The beautiful Anysberg in early morning mists. P. laxum ssp. 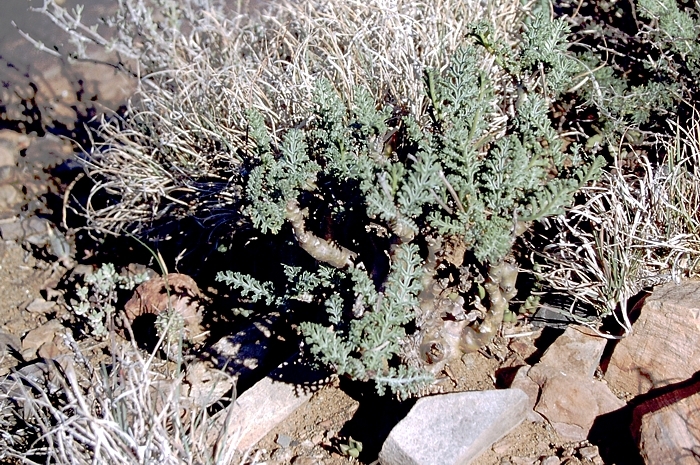 karooicum is found in the succulent scrub at its foot. 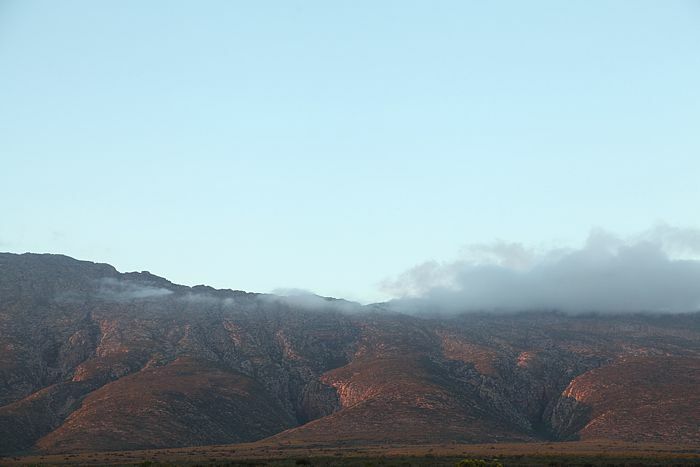 A climb up the mountain reveals one of the quickest transitions from karoo to fynbos vegetation, which abounds at the top. P. laxum hybridizes freely in nature and as well as in greenhouse culture. Here, a rather beautiful natural hybrid from N Perdepoort, E Cape. P. laxum ssp. karooicum had been known in cultivation for a good while before Becker described it in 2008. 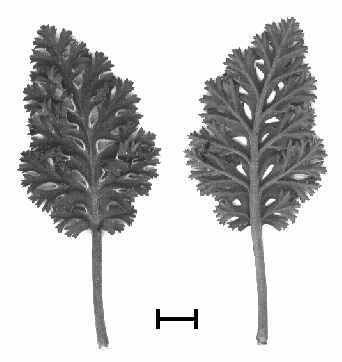 It would appear possible that the plant collected by Fiona Powrie (of Kirstenbosch) in the Anysberg Nature Reserve (reported in Geraniaceae Group News 59, 1995) was this taxon. 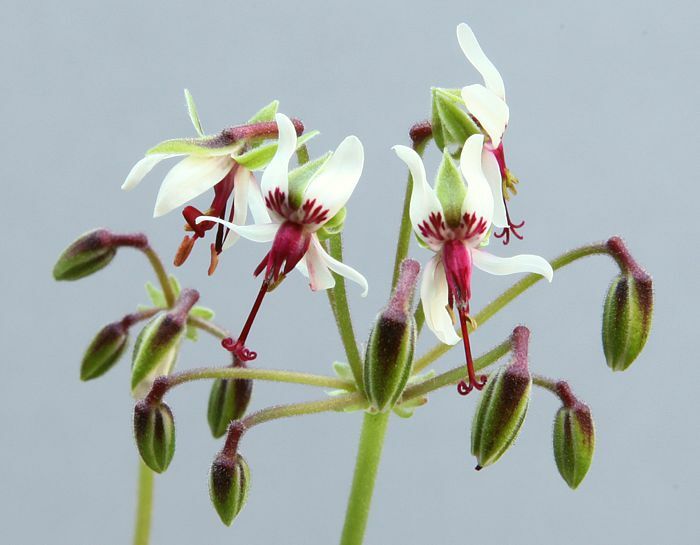 Further specimens have been grown at Era Gardens in Sweden, and have recently been described as P. onustifolium based on greenhouse grown plants which lost the typical tuberous roots, leaf succulence and the red tinged margins of laminas. 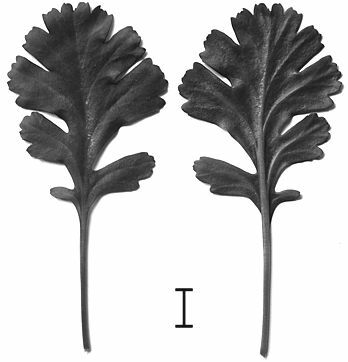 Greenhouse-grown plants also develop incredibly long pedicels, cf. the photograph of naturally grown P. laxum ssp. karooicum flowers above, and those of greenhouse-grown specimens below. Taxa in the Otidia section are often identified on the basis of vegetative characters as well as reproductive structures. 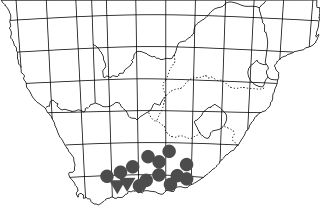 Particularly the former can vary a lot between naturally and artificially grown plants, which has led to an unenviable taxonomic confusion in the section, especially as many taxa have historically been described based on greenhouse specimens, which bear little resemblance to plants grown in the veld, as explored in a bit more detail here. 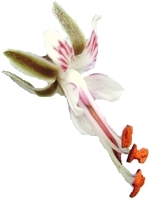 A number of "species" has recently been described on the basis of cultivated specimens, all of which are treated as synonyms here, except P. orientum R. Clifton, which is currently regarded as insufficiently known and may turn out to be a natural hybrid between P. parviflorum Wendl. and P. laxum ssp. laxum (Sweet) G. Don. Along with P. keeromsbergense, the two subspecies of P. laxum form a complex of taxa. 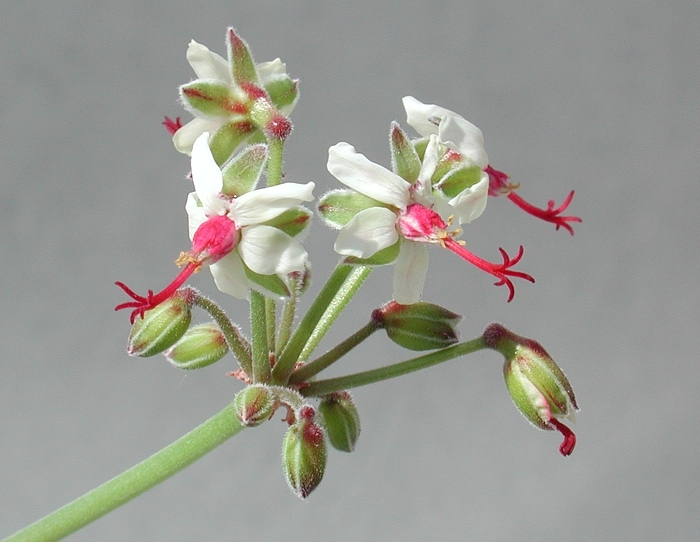 M. Strlič: The Laxum Conundrum, Pelargonium Notes, #8 (2018).